An author website is a central hub for your books and your writing. Here, you’ll reinforce your brand, encourage sales, offer exclusive content, make major announcements, interact with your fans, and build your audience. The tech experts at Web Design Relief know that designing such an important centerpiece can be intimidating. Yet with just five essential pages, you can achieve all those goals. When potential fans find their way to your website, the homepage is what they see first. Although you might be tempted to jam-pack it with as much information as possible, a clean, uncluttered, smartly directed homepage works best. Project your author brand through effective color, imagery, and design elements. Humanize the author with a professional head shot, words of welcome, and/or a letter to readers. Inform the visitor of what’s inside with a clearly labelled, clickable menu bar. Include a Q&A where the interviewer is one of your characters. Post candid photos that reveal your hobbies, travels, garden, artwork, or pets. If you’re comfortable with being filmed, include a video introducing yourself and your books. Tell your life story—or how your interest in writing began—in funny, moving, or otherwise enthralling anecdotes. Encourage engagement by including a Call To Action to join your mailing list, engage with you on social media, or subscribe to your blog. How you design this page (or these pages) depends on how many books you have written or how many publication credits you have. 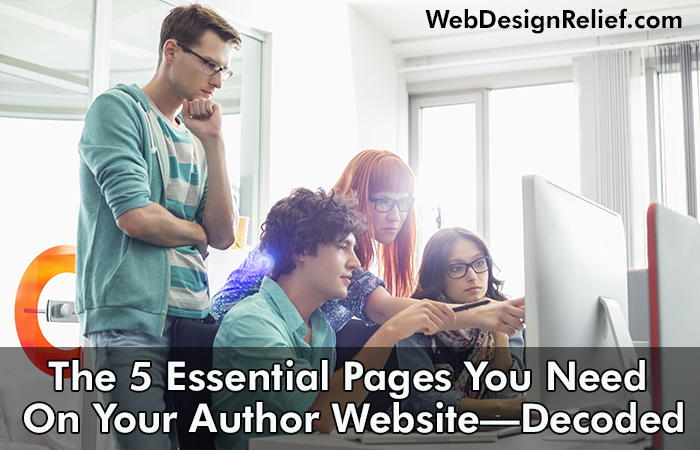 For an author with only a few publications or books, a single page may be all that’s needed. For a book author with a series, or multiple series, a page that lists the books in order and delineates any links between them is an absolute necessity. Very prolific authors may want to design a page with a full book list that has clickable links to send readers to specific pages for more information. When a reader selects this page, she or he wants to send you a message. A contact page should provide a form that is linked to your author email address, so that any questions come directly to you without your visitor having to leave the webpage. A website can function perfectly well without a blog. But if you’re an effective blogger, an active blog can raise your website’s SEO, your profile, and attract more subscribers. For those authors who contemplate blogging with a weary sigh, consider easing the pressure by using your website blog page just for cover reveals, book launch announcements, holiday greetings, or even a travelogue. Effective website design combines technical proficiency with an artist’s eye—so, unfortunately, there are plenty of ways that amateur website design can go terribly wrong. Authors can limit mistakes by thinking long and hard about branding, determining exactly what you want the website to do, and hiring a professional designer whose work you’ve researched and admired. Question: When you visit an author’s website, what do you usually look for? A list of books? The latest news? A blog post? Details about the author?